Here HowToController and AboutController, both are controllers under answerit module. They don’t have any dependencies (empty third braces ). Here vm means ViewModel and it works just like the $scope variable which Angular provides for two way data binding. We add a string type property named about to the vm in AboutController and initialized with some about text. Likewise, in HowToController we add a string type property named howto to the vm and initialized with some howto text. 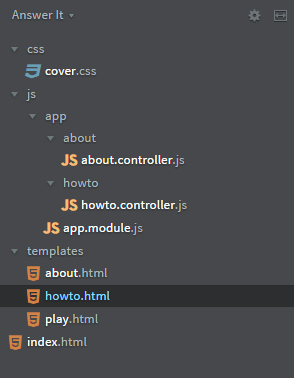 Finally add the howto.controller.js and about.controller.js references after the app.module.js in the index.html file. Run the app and you will get the "howto" and "about" text in the respective views. I’ve added the test property just to check whether the routes are working correctly or not. Update the routesConfig like before with controller and controllerAs properties for play state. Now add reference to the play.controller.js script into the index.html file and give your app a spin. Everything should work fine. You should see the test text in the play view. 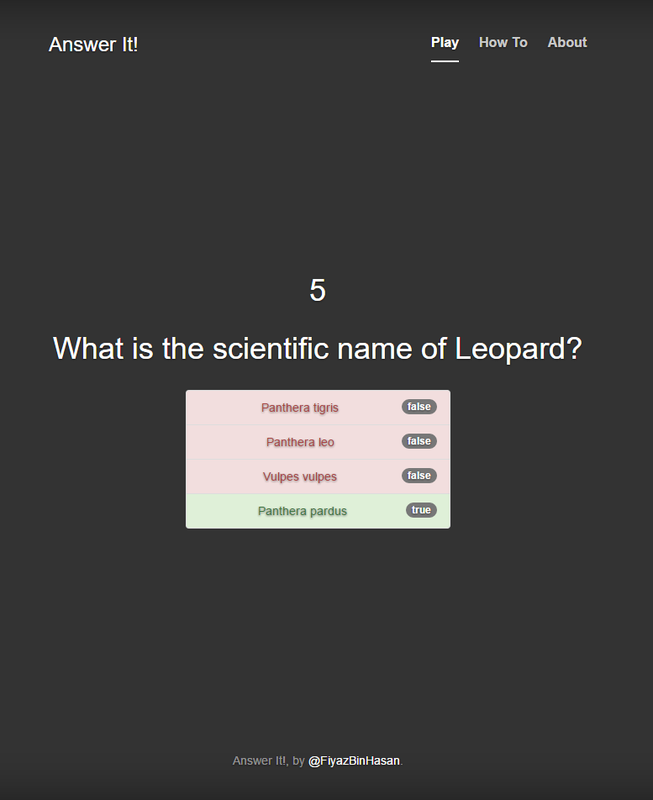 If the timer is stopped, means the time is up (user didn’t give any answer) and the result flag of the answer is true then decorate the correct answers with a class of list-group-item-success (green fill on the list item). Do the same if the user gave the right answer. If the question was answered but the selected answer was incorrect then apply list-group-item-danger (red fill on the list item) just on the selected answer. Do the same if the timer has stopped and the player didn’t answer the question (wrong answers are red). Run and check the app if its working correctly. If you find another easy logic to achieve the same scenario, post it in the comment section. N.B: The right side Boolean flag badged are there only for testing. It will be removed when we will finish building the full app. In next post we will build a server using ASP.net Core 1.0 MVC and serve up multiple questions using API. See you in the next one.